Two weeks before the end of August is celebrated the feast of The Sacro Cuore di Maria. Among the many attractions the Sardine's Festival, tell "La Sardiata" that is the a feast of roasted sardines offered by the local fishermen to everybody present. 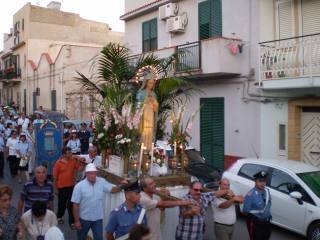 The feast culminates with a sea procession with the Madonna carried by lighted boats. Very suggestive is the red sunset with the temples in the distance. After returning to the port of Madonna, the feast ends at midnight with a beautiful show of fireworks.